What is it? Flaxseeds are flat, smooth, glossy seeds that come in shades of brown or gold. Scoop up a handful of flaxseeds, and you'll notice that they are just a bit larger than the more familiar sesame seed. This still-tiny titan of the grain world has been a nutritional supplement to diets since the Stone Ages. Flaxseed sometimes goes by the name linseed, and its oils turn up often in liquid and supplement form, though this article concerns only the seed itself. What is it good for? 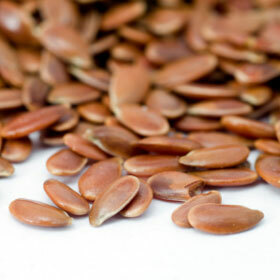 Toss a tablespoon of flaxseed into the foods you eat for a shot of omega-3 fatty acids. Alpha linolenic acid, the kind of omega-3 fatty acid abundant in flaxseed, is converted to eicosapentaenoic acid (EPA), which is the omega-3 fatty acid abundant in fish oils. EPA offers protection against heart disease, high blood pressure, and bone loss, and has many other potential benefits currently under investigation. Flaxseed can be a good alternative for those who want their omega-3s without a fishy aftertaste. Flaxseed is also a hearty source of both soluble and insoluble fibre, which helps to lower cholesterol, stabilize blood sugar, and aid in healthy digestion. Lignans in flaxseed may protect against certain kinds of cancer. What does it taste like? Flaxseeds may be eaten whole or ground. Whole flaxseeds' flavour is earthy, nutty, and quite subtle, with a delicate crunch. Whole seeds can be sprinkled in granola cereals or added to cookie or muffin mixes for some pop and crunch. Keep whole flaxseed fresh in an airtight container stashed in a dry, dark, cool spot. Ground flaxseed is considered more nutritious because it is more easily digested than the whole seed (which may pass right through the body intact). The texture of ground flaxseed may remind the palate of cornmeal or oatmeal. Sprinkle it into yogurt, smoothies, shakes, or a hot cereal. Ground flaxseed may oxidize and spoil quickly, so store according to packaging instructions. And don't cook with flaxseed - either ground or whole. Rather, add it to a dish once it's cooked.